# 219 sector 10, Panchkula, Haryana 134109 Click for Map DirectionBranch-1 (Panchkula) #219 SECTOR 10, Panchkula, Opposite Sector 11 Main Showroom. Branch-2 (Pinjore) Gupta clinic Kalka Pinjore road near Vishal Mega Mart St. Thomas school. Branch-3 (Zirakpur) Tooth Care Dental Clinic, VCare Hospital, Plot No 4, Behind Bihari Lal sweets, VIP Rd, Zirakpur, Punjab 140607. This is the part of the tooth that you can see. It’s usually made of zirconium or porcelain for durability and good looks. You can use dental implants to replace a single tooth, multiple teeth or a full upper and/or lower set of teeth. If you need to restore a full arch, you may be a perfect candidate for the all-on-four treatment. Our surgeons will place four implants and then attach a full arch of teeth, giving the procedure its name (all teeth, only four implants). Just as dental implants have emerged as the preferred choice for tooth replacement, the Clear Choice approach has become the preferred model for dental implant treatment. Our team of experts works together under one roof, with a fully equipped, onsite lab, to build beautiful smiles in a way that works for our patients. One team. One cost. One location. That’s the real beauty of dental implants from Tooth care. Patients who need to replace a full upper and/or lower set of teeth can now receive all-on-four implants. An oral surgeon will place 4 implants and then attach a full arch of teeth, giving the procedure its name. Occasionally a patient is missing more than one tooth, but still has healthy gums and surrounding teeth, and a multiple implant is the best solution. Two fixtures are implanted and the crown is attached, leaving other natural teeth intact. 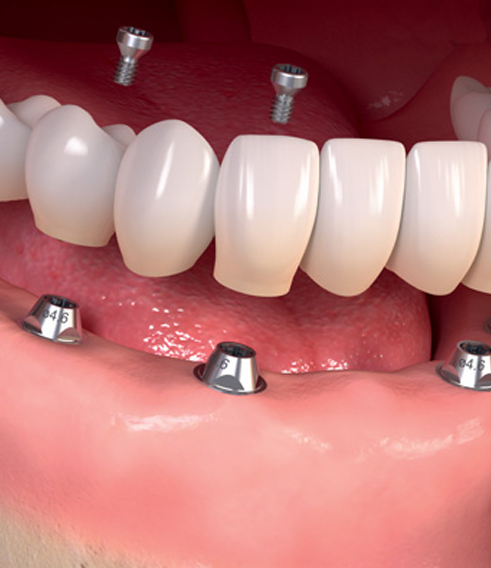 The multiple implant is not for everyone, and even if a patient is only missing a few teeth, it may still be preferable to perform an all-on-four procedure. If you have lost a single tooth due to an accident or from periodontal disease, that one tooth can be easily replaced using a dental implant. Your new tooth will look and function just like your other natural teeth. Where Dentistry Meets Artistry. We create the most beautiful smiles and we keep those smiles beautiful. The Clinic That Guarantees High-Quality Dental Work in a comfortable manner. © Copyright 2019, All Rights Reserved | Tooth Care Dental Clinic.